Eh. triple-stacked 15s. Rarely are these puzzles up my alley. 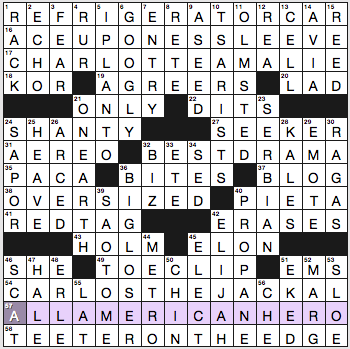 While CHARLOTTE AMALIE, CARLOS THE JACKAL (not dinging the puzzle for the related Charlotte and Carlos names), ALL-AMERICAN HERO (shout-out to Jesse Owens), and TEETER ON THE EDGE are cool, there were too many tradeoffs in the grid. 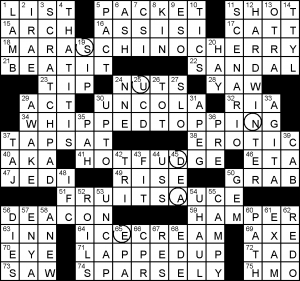 Roll-your-own word AGREERS, green-paint RED TAG, crosswordese DITS RETE ERLE SED (and honorable mention to ELON EMS RUR AVIA AEREO SLOE), partial A SEED, awkward SAPOR, weird abbrev KOR, plural KALES, a forgotten REA … those harshed my cruciverbal mellow. But then again, GOOGLY eyes, landscape genius OLMSTED, BIG LOSER, a cyclist’s TOE CLIP, OVERSIZED popcorn (yes, please) … those were pluses. 3d. [“The foundation of most governments,” per John Adams], FEAR. Topical? 23d. [Like Novak Djokovic, by birth], SERBIAN. You could argue he’s Yugoslavian by birth, since Serbia was part of that larger country when he was born in 1987. 2.9 stars from me. I prefer my themelesses to be less constrained and smoother. I experienced a cultural disconnect with this puzzle. That isn’t its fault. I have eaten a SUNDAE a few times (most memorably at a roadhouse in Randfontein, after which I took my supper home it was that large, for comparison.) but I have never heard of WHIPPEDTOPPING or FRUITSAUCE. Both google typically for commonly used phrases, but I’ve never encountered them before. There are six assymetric answers in this plus-sized left-right symmetry grid. They are the ingredients in a hypothetical sundae: MARASCHINOCHERRY, NUTS, WHIPPEDTOPPING, HOTFUDGE, FRUITSAUCE, ICECREAM. It was a very crowded grid, and you have to tolerate a lot of short stuff, particularly things like EDE and APEG. My error was RAJ/RAPSAT and I suspect I won’t be the only one. This entry was posted in Daily Puzzles and tagged Jeffrey Wechsler, Roland Huget. Bookmark the permalink. Agree somewhat with Amy. But completely. 3.5 stars on this one. It was doable but clunky in spots for me. Too many unfamiliar and odd names. Using kales instead of kale reminds me of how some non-native English speakers use “fruits ” instead of “fruit” inappropriately at times i.e. I like “fruits”. Racing bikes don’t use toe clips, they use clip-on pedals. Also didn’t like “emote” for 29d. I used to bike seriously and had biking shoes with a protrusion on the bottom near the toes. Is that a toe clip? I liked the puzzle. Very challenging. Oddly, the clip-in pedals are called “clipless” pedals. Toe clips are the “baskets” attached to the pedals that you loop your feet into. You don’t see them much anymore, as most people either ride flats (no attachment) or clipless. Ironically, I was a pretty serious cyclist from 1980 to 1984. No, it is a cleat that is inserted into the pedal. (similar to ski bindings) Thus, clip-in pedals. Toe clips have not been used with any regularity in racing since the ‘90’s. Dr. Fancypants described what I believe you’re talking about well. Those “baskets” are screwed on to the middle of each pedal allowing you to place your foot into the “basket” and use your leg biceps and shins on the upward movement. That is old school though. Serious racers with light road bikes and/or mountain bikes pretty uniformly use the clip-in pedals which requires specials shoes. I have ones that are recessed in so that I can walk in them without banging cleats on the street. I had GOOGoo/leANTo instead of GOOGLY/SHANTY; I had RED TAG and then erased it, then put it back, couldn’t quite remember exactly how AEREO went. The rest of the puzzle was pretty smooth. I like long acrosses, but think that they sometimes make for some awkward downs. In defense of KALES: I planted several different varieties of kale this year and I suppose one could ask how many kales I had planted. Maybe. Either way, yum. Same thing with GOOGOO and LEANTO before realizing it wasn’t going to work. I guess it’s legit to use plural KALES but it doesn’t seem like anything a person would say in reality. In your example, “different varieties of kale” makes sense, but saying that you planted a lot of kales doesn’t, to my mind. Does it mean you planted a bunch of kale plants, all of the same type, a selection of kale varieties, or some combination of the two? If it’s ok by Burpee, it’s ok by me. Well, OK. I personally wouldn’t say or write that but I agree it makes sense in that context. Wow, those are some gorgeous kales! Thanks for the Burpee link. I’ve never understood the dispute surrounding plural nouns. The argument that “I would never say it that way” simply doesn’t hold up. If no one ever used it that way, it still doesn’t change the validity of its plurality. Sometimes I think if Amy were to have her way, there would be no plurals in puzzles. In all fairness, Amy never said she’d never say it that way, although another commenter did. It’s not really controversial to say that “kales,” “deers,” “sheeps” and other plurals forms that are correct in specific contexts but rarely used are nobody’s favorite entries. I don’t see anything wrong with calling it out as such. That’s very different, in my opinion, from a “doesn’t Will Shortz know that “kales” is not a word?” type of comment. Those are the ones that bother me, when the word in question is supported by the dictionary. I plant two or three varieties of Kale every year. Aphids are a huge problem with Curly Kale, my favorite, in the South because the critters hide in the folds. I have a 3-d microscope used to id bugs live and film them. They look like aliens from another planet. NYT: REFRIGERATed CAR and CHARLOTTE AMeLIE meant I finished with eLMSTEAD and dEe in the Down direction, both of which felt plausible to me. Those crossings don’t seem entirely fair. In addition to being a landscape genius, Olmsted was a terrific writer who traveled the South reporting for the New York Times in the decade before the Civil War. His articles about slavery have been compiled into a book, “The Cotton Kingdom,” which you can get in Kindle form for $1 on Amazon. Fascinating stuff. Olmsted was my first entry. Gnarly puzzle. I seem to recall that he was an architect for the 1893 World’s Expo in Chicago. I read about him in the excellent book Devil In The White City, by Erik Larson. He also had a role in Yosemite Park formation (Olmsted Point) (http://www.wbur.org/news/2015/08/07/olmsted-yosemite-report) and his sons, the Olmsted Brothers, designed my favorite local hiking spot in Dayton, OH (Hills & Dales MetroPark). Did not know about his writing. Fascinating man. So many unfair crossings today. REFRIGERATedCAR/CHARLOTTEAMeLIE/eLMSTED/dEe make too much sense, and there is no way to infer any of that without prior knowledge. BITuS/SuD isn’t too crazy either. I had SAvOR/vACA (Spanish for “cow” because what the frak is an agouti?) instead of SAPOR/PACA because what the frak is a sapor? Oh wait, it actually means “savor”? GTFO. I haven’t been commenting here because I don’t want to be the guy who is too negative, but for two weeks now I haven’t solved an NYT puzzle that made me go “well, that was fun!” (To be fair, there were above-par ones but usually there is at least one puzzle every week that I utterly enjoy) But yes, this one was just the rotten cherry on top. Jeez. I ended with AMeLIE/REe, having never heard of this particular REA (can we please keep it clued as the more current Stephen REA, rather than someone lost in the tides of pop cultural history?). I had a hard time convincing myself RETE was correct even after getting confident in the crosses–despite well over 20 years of crosswording, I don’t recall seeing that little gem before. And I nearly ended with the SAvOR/vACA crossing (even knowing what an agouti is), and only went with SAPOR because it seemed more in line with this puzzle’s general clunkiness. I ended with the same AMeLIE/REe error – but blamed myself, not the constructor. AMALIE shows up regularly in the NYT, usually as a “Charlotte ___” FITB. I should remember the spelling, but sometimes don’t. And I’ve heard the Chris Rea song “Fool if you think it’s over” on the radio a couple of times in the past week or two. My 8-year old grandson can tell you all about agoutis and PACAs – they’re among his favorites at the zoo. I am happy for your grandson, but I’m still unhappy with the puzzle. I admired the stacks in the NYT and the challenge. Indeed, I thought I’d stumbled onto a Saturday puzzle. But I must admit I don’t entirely credit it with a very rare Friday do not finish. I had a crossing of RE_ with AM_LIE. Was it A or E? No way to know. Ugh, I, too, had GOOGOO and LEAN-TO and never recovered, with no obvious associations with the rest of the due central west. (AEREO doesn’t ring a bell, and nor do rodents like agouti and PACA, although I’m delighted to become acquainted with them.) Maybe I should have got it, but you never know.